Big Scoob is back and grittier than ever as he takes us back to the streets that made him. HipHopDx.com premiered the brand new music video for Scoob’s “All I Kno Is Hood”, and it is already creating quite a stir online. The video finds Scoob riding through his hood laying down some heavyweight bars along with Krizz Kaliko on the hook. From a neighborhood block party to cruising the town, Scoob rides through in style with his classic whip. Even the liquor store isn’t safe from the big fella, as he loads the drinks by the case. Joining in the hood celebration, Tech N9ne makes a cameo appearance to support Scooby’s banger. Public drinking, BBQ grilling, and pitbulls, how much more hood does it get?! Scoob comes correct on this anthem produced by Icy Rock Kravyn. The streets are calling, and Scoob answers right back in this concrete jungle slammer. 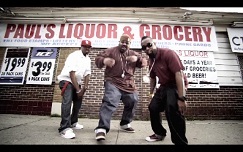 What did you think of Scoob’s “All I Kno Is Hood” Music Video? Leave your thoughts below!